The early rain clouds cleared and the hungry crowds arrived on Saturday, set to dig in to the copious offerings of food and fun at the ninth annual Taste of the Seaport. Festgoers wended their way among the tented booths of more than 40 restaurants on Piers 16 and 17, much to the benefit of some 10,000 palates and two local schools, the Peck Slip and Spruce Street Schools. Then there was the entertainment, from the Peck Slip School’s dancing Bollywood Starlets to knife-juggling magician Gary (The Great) Ferrar to recording artist Queen V, and many more. As always, a KidZone was there for children hungrier for play and creativity than new cuisine. Until this year, Front Street was the main drag for Taste of the Seaport and Paul Hovitz, a longtime Community Board 1 member and advocate for local schools, explained from the stage how it began there. 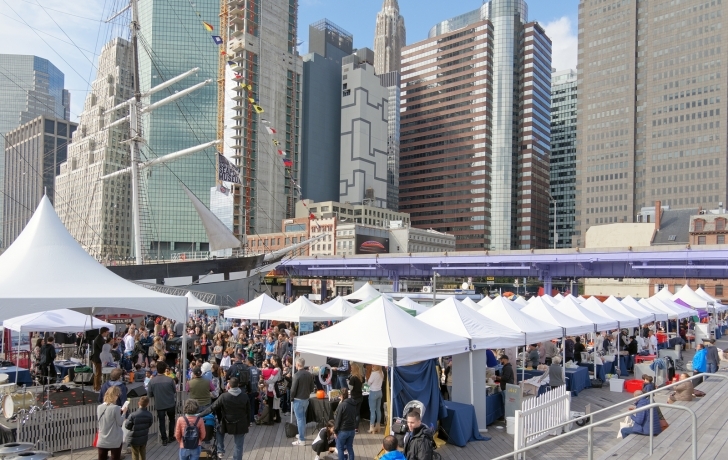 What started under the name Taste of Front Street became Taste of the Seaport under the sponsorship of the Howard Hughes Corp. With all the notice that the Hughes redevelopment of Pier 17 has been receiving, organizers saw a chance to tap into that attention, not to mention provide a roomier space for the event. “Those businesses on Front Street,” Ganley added, “have been supporters of the Taste since the beginning, so we want to make sure that we remain partners with them as well. Our hope was that even though we moved to the pier we still tried to take steps to drive business to them.” Though Ganley said there are mixed opinions about leaving Front Street, he thinks the event will probably return to the piers next year for a “blow out” 10th anniversary of the event. Nancy Harris, the Spruce Street School principal, agreed.